This is a fictional site. Here you will learn about the Lego Regional Fire Authority. LRFA is a fictional fire department. Everything on this site is for entertainment and hobby purposes only. Thanks for Visiting, Enjoy! Click on my picture to send me an E-mail. 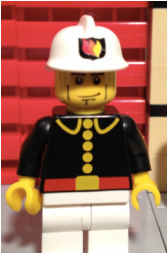 The Lego Regional Fire Authority was established in December 2012 after the consolidation of the City of San D'Lego and Lego County Fire District. LRFA answers an average of 19,000 calls for service each year in a 38 square mile area. The areas covered by LRFA include 45% Residential, 30% Commercial, 15% Industrial and 10% agricultural zones. Currently, LRFA operates seven engines, two ladders, one quint and one rescue unit out of eight strategically placed fire stations. OUR 500TH UNIQUE VISITOR STOPPED BY ON NOVEMBER 15, 2014!!! OUR 1,000TH UNIQUE VISITOR STOPPED BY ON AUGUST 15, 2016!!! DISCLAIMER: LRFA IS NOT ASSOCIATED WITH LEGO® OR ANY COMPANIES REFERENCED IN THIS SITE. LRFA IS A FICTIONAL SITE FOR HOBBY AND ENTERTAINMENT PURPOSES ONLY.